Like most big chains, Subway has specifications for everything -- how to slice the bread, the precise way to fold and layer meat, the order in which to add veggies, and more. And every spec is tested in focus groups before it's implemented. What's more, Subway is the world's largest restaurant chain, which means that when they change one little spec, millions of sandwiches across the Eatscape are affected. 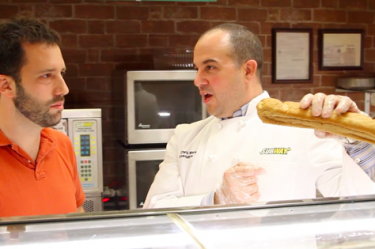 For some inexplicable reason, the folks at Subway let me make a sandwich with their executive chef and ask him all sorts of ridiculous questions about their specs. But I didn't just absorb knowledge. I also dropped it. We made this video with our friends at Slate to mark this meeting of sandwich minds.